Did they know they were cheering for a military genius? 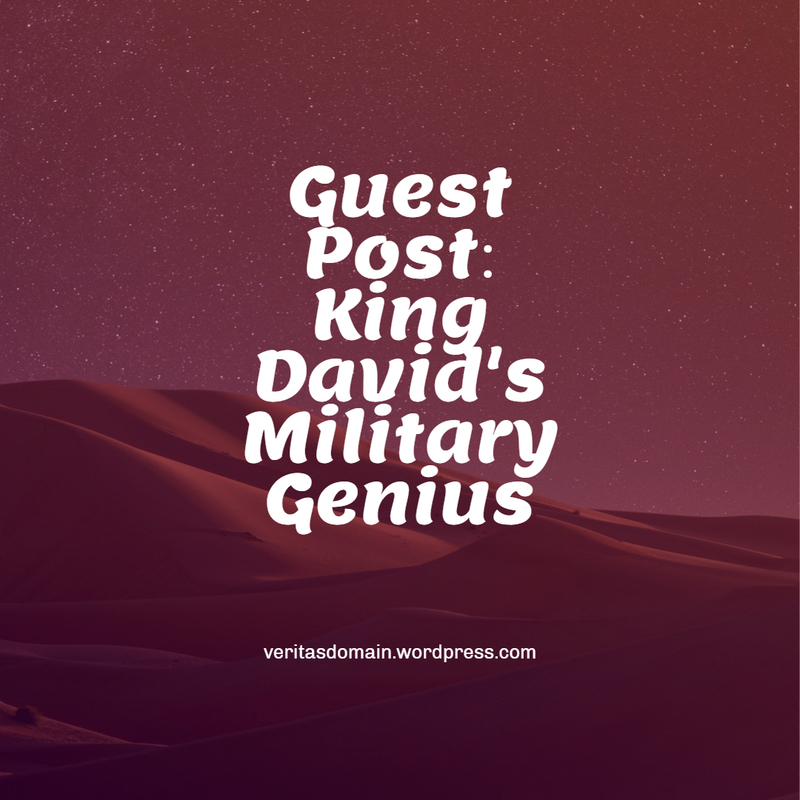 As revealed in the Biblical account, King David must rank as one of history’s most gifted military leaders. We get the most information about his military skill in 2 Samuel 15-18, which tells the story of Absalom’s revolt. David’s victory, ordained by God, in this civil war displays the king as a strategist and tactician par excellence. For those who question whether David ever existed, the uniqueness of his generalship is an embarrassment. Priest and scribes concocting a fiction, centuries after the supposed fact, are hardly likely to have been experts in military science. They would have written it up as a heroic, uncomplicated, glorious victory in a toe-to-toe fight. David’s victory over his rebellious son really happened as told. The technical details of the story argue strongly for its historical authenticity. Jerusalem was David’s capital, his home. Someday he hoped to build God’s temple there. To have defended it against Absalom would have exposed the city to extensive damage. What would be the good of controlling Jerusalem if it were reduced to rubble? But David had another reason for giving up the city. Consider the fates of those who did try to hold it. Judah defied Nebuchadnezzar of Babylon in 586 B. C., and wound up with a dead king, a ruined city, and 70 years in captivity. In 70 A. D., Jewish zealots tried to defend Jerusalem against the Romans. The Romans took the city, destroyed the Temple, and sold the surviving defenders into slavery. And in 1099, with Muslims defending the city, Jerusalem fell to the armies of the First Crusade. As General George S. Patton often said, fixed fortifications are a monument to the stupidity of mankind. Unless supplied from the outside and defended capably, a besieged city will fall to any determined and competent attacker. By allowing Absalom to take Jerusalem, David saddled him with major distractions — the administration of a major city, its expenses, and incidentally, the king’s stable of concubines. The Roman historian, Livy, described what happened to Hannibal’s victorious Carthaginian army when it took over the city of Capua, famous in those days for its luxury and hedonistic lifestyle: “… Capua robbed his army of the strength needed to conquer at all. Indeed, when he [Hannibal] left Capua, it was with a different army — all trace of the old morale was gone.” 4 Nothing like easy success to dull an army’s fighting edge. Nothing like a long dalliance with concubines to dull a commander’s fighting spirit. An army on the move is an army with an opportunity. Hannibal on the loose in central Italy threatened Rome’s survival. Bottled up in the south, in the “heel of the boot,” he accomplished very little. In 1863, Robert E. Lee led his Confederate army into Pennsylvania. It was the only way he could get the Union Army out of Virginia. To that extent, his plan succeeded. Similarly, King David retreated from Jerusalem, crossing the Jordan into friendly territory where he recruited allies and received supplies. He arranged for Absalom to be delayed in Jerusalem until his counsels were divided and he was forced to go out in person, leading his army into territories where David’s allies knew the ground — where David could select the time and place best suited to his counterattack. Because he was in territory friendly to David, and because David had been retreating from him all along, Absalom did not know where David’s army was until it attacked him. He was not ready. The king’s forces routed Absalom and killed him. This was precisely what Lee hoped to accomplish by invading Pennsylvania. The difference was that Lee didn’t know where the Union Army was until he ran head-on into it. His strategy was the same as David’s, but where David succeeded in carrying out his plan, Lee came to grief at Gettysburg. David knew at all times where Absalom was and what he was doing. But Absalom did not know where David was. By “planting his people on the inside,” David stayed fully informed of his enemy’s situation. The loyal priests, Zadok and Abiathar, who would have followed him, David commanded to remain in Jerusalem. There they would observe Absalom’s activities, his mood, the morale and readiness of his troops, and other things useful for the king to know. Their sons, Ahimaaz and Jonathan, delivered the information to David promptly. The Bible doesn’t mention it, but as Absalom’s army crossed into David’s territory, it’s safe to assume the king had him watched and reported on every step of the way. Where David truly excelled as a general was in installing his friend, Hushai the Archite, as one of Absalom’s close advisors. This was one of the great intelligence coups of all time. Hushai was what Sun Tzu called “Inside agents… enemy officials whom we employ.” 10 His job was to counter the good advice of Absalom’s mentor, Ahithophel, and feed the rebellious prince bad advice that David would use to his advantage. Hushai succeeded so brilliantly that Ahithophel, now that Absalom ignored him, committed suicide (2 Sam. 17:23). This final touch puts David in a class by himself. We have no record that Julius Caesar, Napoleon, or Douglas MacArthur ever succeeded in planting a friend among his enemy’s closest advisors. As Sun Tzu might say, a general who is able to do this can hardly be expected to lose. The Bible tells us King David consulted the Lord whenever he wished to go to war, and only went when God was willing. We who believe have no difficulty with this. But for those who doubt, the fine details of David’s military operations, which display a level of expertise seldom matched, ought to make a strong argument that the Biblical account is not pious fiction, but factual history. 1 As reported by the Agence France Presse, Nov. 6, 2004. 2 Sun Tzu, The Art of War, translated by S. Griffith, (Oxford: Oxford University Press, 1971), x. 4 Livy, The War With Hannibal, translated by A. De Selincourt, (New York: Penguin Classics, 1972), 190.
excellent teaching Michael !! Thank you!!! This is very interesting! I’ve never really thought about David’s military tactics like this before!